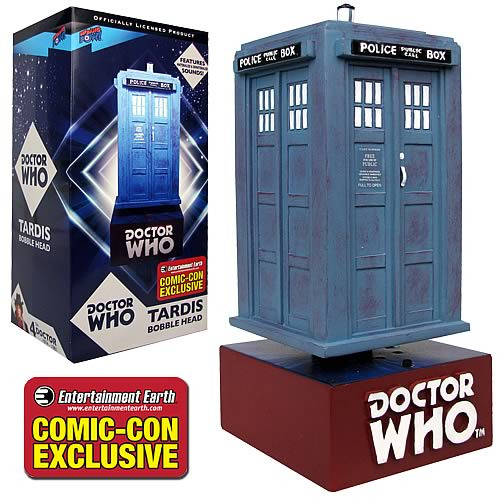 Exclusive TARDIS Bobble Head bobbles and includes sound! Features a remarkable Doctor Who-themed base. Entertainment Earth Comic-Con Exclusive! With this extraordinary TARDIS Bobble Head based on the Classic Series, the entire TARDIS bobbles... and it includes the signature materialize and dematerialize sounds! Measuring approximately 6 3/4-inches tall x 2 3/4-inches wide x 2 3/4-inches long, the one-of-a-kind bobble head also features a remarkable Doctor Who-themed base with a button to activate the sound. You gotta get one of these! Limited edition of 3,000 individually numbered pieces. Note: This item will first be available to purchase in person at San Diego Comic-Con and New York Comic-Con. Online orders will ship after New York Comic-Con, while supplies last. TARDIS stands for Time And Relative Dimension In Space and looks just like a wooden Police phone box from the 1950s on the outside, but is of infinite proportions on the inside. This incredible time machine is piloted by the Doctor, a mysterious Time Lord, and is able to transport him anywhere through time and space, disappearing in one place and reappearing somewhere new. Limited edition of 3,000 pieces.